“Republic in Takoma Park just debuted a new happy hour menu featuring $7 select wines, $7 Addie’s Mussels and $1 Chesapeake Bay Oysters. Republic’s happy hour also allows guests to choose from their extensive all-local beer menu for any $5 mini pint, which currently includes a wide selection from Right Proper Brewing Company, RAR Brewing Company and Hellbender Brewing Company. The menu features seven different cocktails all for a special price of $7 including a Sazerac, Dirty Martini, Moscow Mule, Tom or John Collins, Aperol Spritzer, Sebring Convertible – the restaurant’s take on a Margarita made with tequila and lime, and a seasonal shrub. Throughout happy hour, guests are able to order off of the entire bar menu as well, featuring snacks like crispy Cotija cheese with lemon aioli, deviled egg and pickled veggies or the fried B & B pickles with smoked pepper aioli. Happy hour is available at the bar Monday through Friday from 3:00 p.m. to 7:00 p.m. 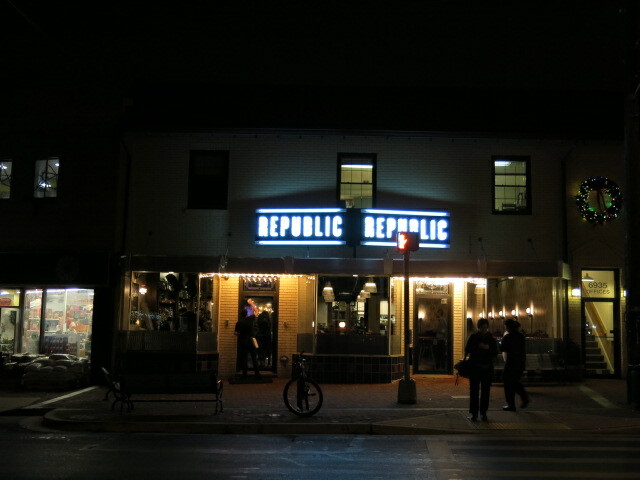 In addition, Republic also offers a “late night” menu every evening from 10:00 p.m. until close, which will feature all of the happy hour drink specials along with $1 Chesapeake oysters. The full bar and happy hour menu offerings can be seen below.